When it comes to choosing a generator, portability should be considered first. And, with a good wheel kit, your Honda EU3000iS is more portable. The transport the generator from home to a certain location is no longer a matter if being placed on smooth-rolling never-flat tires. Nevertheless, finding a really great Honda EU3000iS wheel kit is not easy. That is why, in the article here, I’ve picked out quite several wheel kits fit perfectly with the Honda EU3000iS generator. 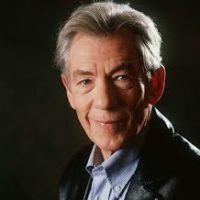 For more details, please keep track of the following information which is the result of my research. All the mentioned wheel kits in this list are designed to fit with not only the EU3000iS of Honda but also other generators. Based on my knowledge of the dynamo realm and hours studying online as well, I finally selected 12 steady wheel kits to move your generator with ease. 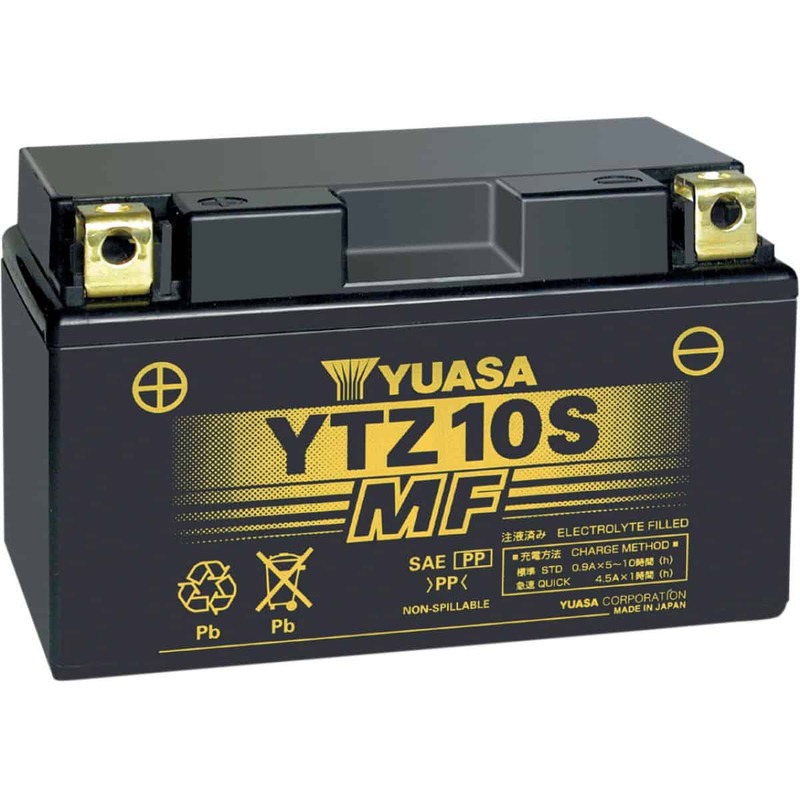 Check out and select the best one for your generator! 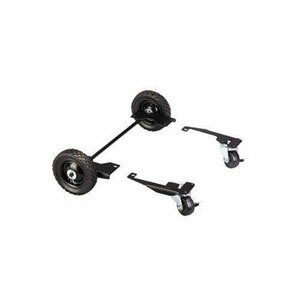 If you find struggling to relocate your Honda generator, things now will be much easier with the help of Reliance Front Swivel Wheel Kit from the manufacturer. Overall, Reliance Swivel Wheel Kit seems to work okay. Wheels are strong and sturdy and can assist you in moving the generator on all terrains. 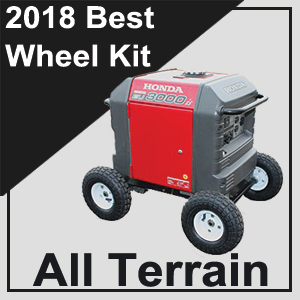 No need to lift your Honda EU3000iS – Here comes the versatile wheel kit that can handle any condition as well as transport the generator on any type of terrain. Using the knobby tires, this tool helps you push the heavy inverter across mud or sand with ease. 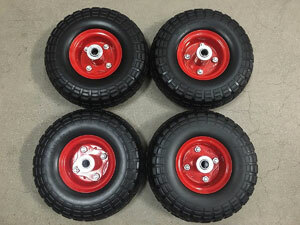 When using this All Terrain Wheel Kit, remember NOT to replace the never flat tires to the air tires. From my experience, the air tires will be flat within a week after the purchase and permanently. Now, moving the generator into the back of your truck or toy hauler is much simpler. 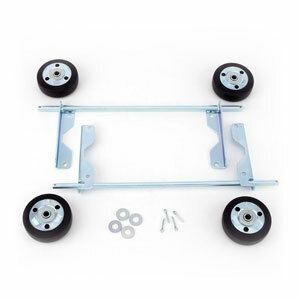 If you are searching for a wheel kit to move your generator around conveniently, then I recommend Reliance 4-Wheel Swivel Kit, a product that will meet all your expectations. Quickly to install, it only takes you approximately 15 minutes. The generator can be moved effortless on smooth surfaces with Reliance 4-Wheel Swivel Kit. In general, the unit can swivel and turn easily. Note: Do NOT use it on dirt! 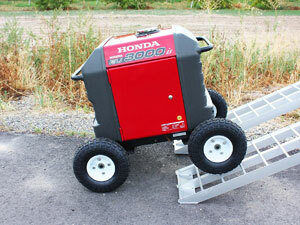 In order to help you with the relocation your inverter, Honda has already launched the wheel kit for EU3000iS. This product is manufactured professionally to make sure fitting well to your generator and providing the top-notch quality. The installation is greatly easy – you can finish installing the wheel kit in just 10 minutes using existing generator hardware. No modifications required, also. Take a glance at the 4-fixed wheel kit for the EU3000iS inverter generator. Most parts are upgraded and replaced completely – this product is guaranteed to be advanced in quality and standard. This Honda 4 Fixed Wheel Kit is built primarily to your Honda generator; thus, compatibility-related issues are likely not to happen. And, keep in mind that the product does not feature the locking wheel. 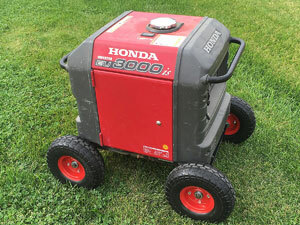 Generator not included when you purchase this Honda accessory, wheel kit only. 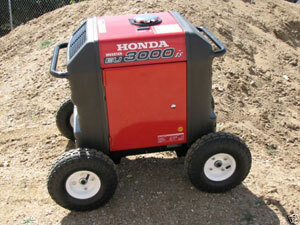 Now, with the 2-wheel kit of Honda featuring the telescoping handle, your job with the generator is much smoother. Telescoping handles added to ease the lifting process and maneuverability. 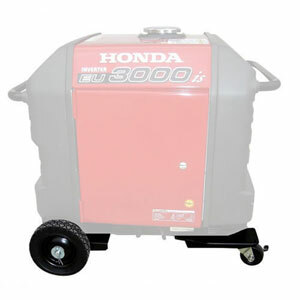 Shortly, Honda 2-Wheel Kit & Telescoping Handle is a must accessory for anyone owning an inverter generator. This tool is very lightweight and convenient to utilize. 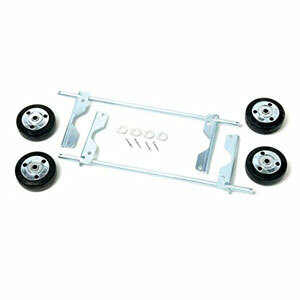 You will receive a package of the wheel kit and a hardware bag when purchasing this Honda Wheel Kit. Feel exhausted every time lifting your heavy generator? This option will surely bring your tiresome away. Thanks to the 4-Wheel Swivel Kit of Reliance, you can move the machine with no effort. The product takes you only 20 minutes for the installation. Reliance Control Corporation 4-Wheel Swivel Kit is portable, safe, and easy-to-use. If you want to move the generator around without any problem, order this accessory to your home now. 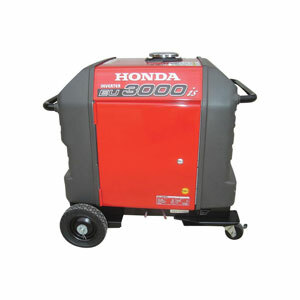 Sturdy and well-built, Honda 2-Wheel Kit plus 2 telescoping handles will help you lift and move the EU3000iS generator on smooth and half-smooth surfaces without causing any problems. You can mount the product in just a few minute. Purchase it for your generator machine to enhance the productivity. From now on, relocating the heavy inverter around can be done in a glance. This Honda 2-Wheel Kit will guarantee to meet all of your expectations. The instructions are pretty simple to follow; hence, you’ll find no issue with the installation. 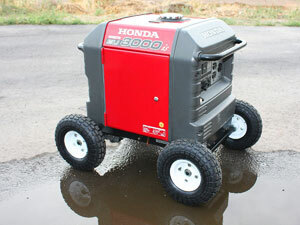 This is a genuine accessory for Honda EU3000iS generator. When the blackout happens, the only thing you need is a portable generator easy to move around. Guess what? SIKK All Terrain Wheel Kit, with a lightweight durable construction, is another choice that you should consider. No modification required; the progress of installation takes you at least 10 minutes. 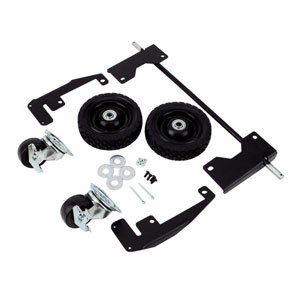 SIKK All Terrain Wheel Kit has a lighter weight if compared to other products and is packed with higher load capacity. Since the generator EU3000iS is pretty heavy (approx. 134 pounds), you must equip it with the Autoworks Wheel Kit. According to the manufacturer, this accessory can help your generator last longer. Why do you need to buy the wheel kit for your inverter generator? The sturdily built steel construction can endure the weight of your generator all the time making it easy for you when using the machine in any rigorous condition. The wheel kit from this manufacturer has a sleek look matching perfectly to the EU3000iS. Access here if you want to gain more info for this Honda accessory. Honda EU3000iS is quite heavy (140 pounds). That’s why you need the wheel kit to move it around. 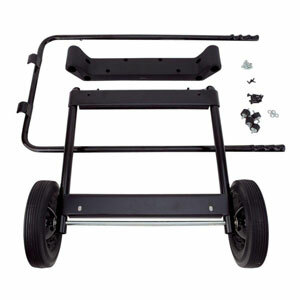 This versatile transport cart fits most portable inverters well, especially Honda products. Without the assistance of Honda Front Swivel Mobility Wheel Kit, your job related to the generator would be difficult. When making an order with any product mentioned here, note that the generator is not included in the whole package.